Everyone, I am very happy to announce that MYTHIC #8 is finally available. I've had some complications and some setbacks that have made this issue and the next one very late. I am working to fix that. You will be able to see Issue #9 shortly as well. Right now I'm reading submissions intended to fill Issue #10 and #11 this year. In fact, the current reading period has about a week left. All that said, I should have the schedule for MYTHIC back on track in the next few weeks. So, hurray! But, now back to the current issue that is on sale. You can buy it from Amazon and other retailers online. You can pick up electronic copies by visiting Payhip. I appreciate your patience as I get all of this sorted out so everyone receives MYTHIC: A Quarterly Science Fiction & Fantasy Magazine. 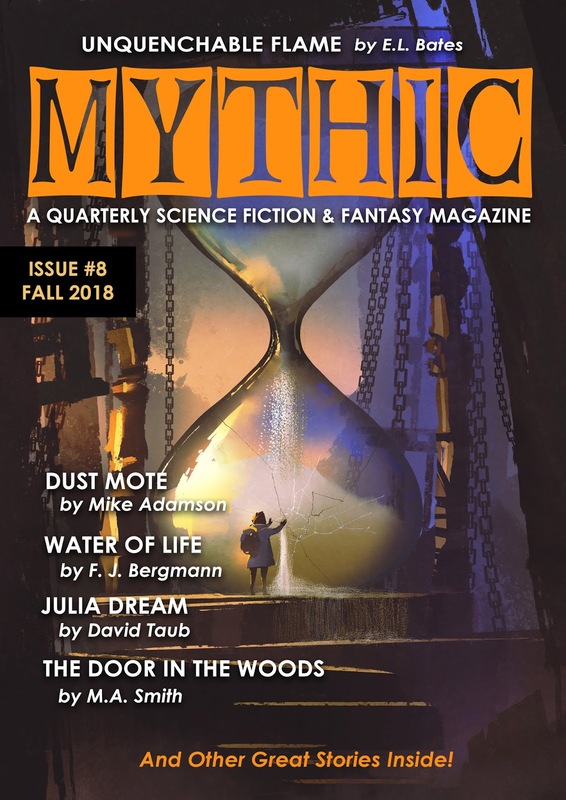 If you wish to subscribe and otherwise support this magazine and help us in our mission to become a professional market for science fiction and fantasy short fiction, please consider becoming a subscriber. One way you can do that is by becoming a patron via our Patreon Page. There you will find different tiers of membership. Not only can you subscribe for as little as $2.00 per month, but you'll get extra content and offers on discounted (or free) books and other exclusives. The more support we get, the better MYTHIC can become. Thanks. I'd add that if you just want a barebones subscription sans the extras, then you can click on the Subscribe tab on this site for other options.